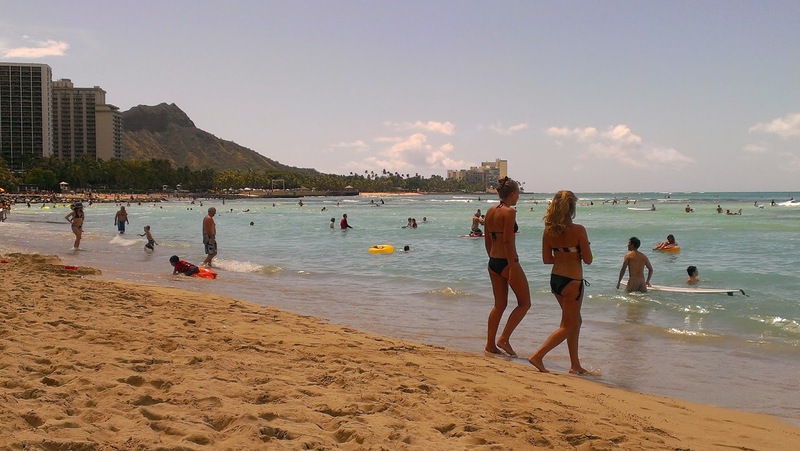 The City and County of Honolulu is considering creating a Special Improvement District to maintain and restore Waikiki Beach. Half of the $1.3 million budget to do the first part of renovation would come from the state legislature. The other half would come from a special assessment to commercial landowners. KHON2. Diamond Head, the extinct volcano that has become synonymous with Waikiki Beach isn’t going anywhere, but much of the sand that both locals and visitors enjoy has vanished. KITV4. President Barack Obama and first lady Michelle Obama greeted military service members and their families at a holiday dinner held Thursday afternoon at Marine Corps Base Hawaii. Star-Advertiser. After a day at the beach, Barack and Michelle Obama go to the Marine base at Kaneohe, where they visit with hundreds of service members and their families. Civil Beat. President Barack Obama marked the end of more than a decade of combat in Afghanistan by paying tribute to America’s military, telling troops on Christmas Day that their sacrifices have allowed for a more peaceful, prosperous world to emerge out of the ashes of 9/11. Associated Press. How President Barack Obama and first lady Michelle Obama spent the sixth day of their holiday vacation in Hawaii on Thursday. Associated Press. More Hawaii residents moved to the mainland than came the other way, but the state still added more than 10,500 people in the past year ending July 1, according to a census report. Births and foreign migrants largely accounted for Hawaii's population boost from 1,408,987 in 2013 to 1,419,561 in 2014, according to Census Bureau estimates released this week. Star-Advertiser. The state Department of Labor and Industrial Relations announced Wednesday that per Act 82, Session Laws of Hawaii 2014, the minimum wage will increase to $7.75 per hour beginning Jan. 1, 2015. West Hawaii Today. Civil Beat’s 10 Most Read Stories of 2014. Hawaii's cost of living, GMO farming and homelessness were among the issues that attracted a lot of attention from our readers. One Christmas present of sorts that came early for consumers in Hawaii and across the country: cheaper gas prices. That fall in fuel prices has also made a difference for a number of publicly-held companies based in Hawaii. Hawaii Public Radio. Honolulu’s current affordable housing rules produced only 68 units in fiscal year 2014. That’s despite a housing shortage that helped drive up the median cost of a home to $719,000 last month. Civil Beat. The University of Hawaii Cancer Center is facing an uncertain future as revenue streams shrink and financial losses mount at the research facility. At the same time, federal requirements call for operations to expand. Star-Advertiser. Gov. David Ige said the state has not done a good job coordinating what public facilities should be built on state property along the rail transit line but he said affordable housing and a new state office building are two important needs. Hawaii News Now. The Hawaii Supreme Court has rejected Tommy Waters’ challenge of the election results in the Honolulu City Council District 4 race, in which Trevor Ozawa won by just 41 votes. Civil Beat. Puna Geothermal Venture plans to drill a new geothermal well to maintain production levels. Mike Kaleikini, director of Hawaiian Affairs for Ormat, PGV’s parent company, said drilling could begin in January and take about three months to complete. Tribune-Herald. Two University of Hawaii at Hilo students are being called the "champions of freedom" for their efforts to protect First Amendment rights on campus. Star-Advertiser. Visitors to the Hilo Naniloa Hotel will find major renovations, long talked about, have begun in earnest. Tribune-Herald. What began as a civics lesson for a Maui Preparatory Academy student in April became a new ordinance banning smoking in Maui County parks and on its beaches. Maui News. Maui leads the state in estimated number of vacation rental units advertised on the Internet, according to an SMS Research study conducted at the end of 2013 and between August and September of this year. Maui News. A Hawaii vacation rental market study shows that alternative renting models continue to make inroads on hotels — and on Kauai, it’s about even on how visitors are choosing to overnight. Garden Island.